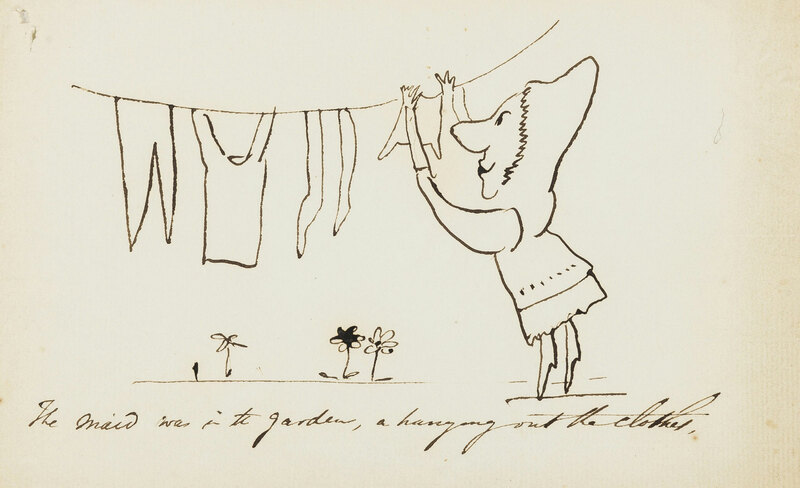 Edward Lear, “The Maid was in the garden, a hanging out the clothes”, original illustration for ‘Sing a Song of Sixpence’, pen and black ink on Whatman laid paper with partial watermark, sheet 138 x 220 mm. (5 3/8 x 8 3/4 in), small pin-hole damage and loss to upper left corner, minor browning to edges, unframed, [circa 1850-1880]. ⁂ Another version of the same subject can be found in the scrapbook compiled by Mrs. C. Beadon between 1852-1880, now held in the Houghton Library, Harvard University, Cambridge, Mass. (see: MS Typ 55.23). Another variant was exhibited at The Royal Academy of Arts, exhibition in 1985, Edward Lear. This entry was posted in Edward Lear and tagged Comics, Edward Lear, nursery rhymes, picture stories. Bookmark the permalink.